Cooking tip: You do not want to let your curry boil or bubble at any time once you’ve added the evaporated milk otherwise the milk will separate and go gluggy. Heat oil in a frypan over low heat. Add onion and cook until soft and translucent. Turn heat up to medium and add chicken and garlic. Cook for several minutes until the chicken has turned slightly golden. Add curry powder and stir well. Cook until fragrant – the point when the spices start wafting from the pan. Turn heat down to low and add evaporated milk, coconut essence and currants. Simmer for around 5 minutes and throw in the green beans. Continue to simmer for another few minutes then turn off heat. Serve rice topped with curry, a handful of coriander/ cilantro and a side of sliced cucumber. Post GDM tip: Replace coconut essence and evaporated skim milk with the same amount of low fat coconut milk. Thanks for the inspiration to cook this yummy and so easy chicken curry! It really was a breeze to prepare and well received by the whole family. 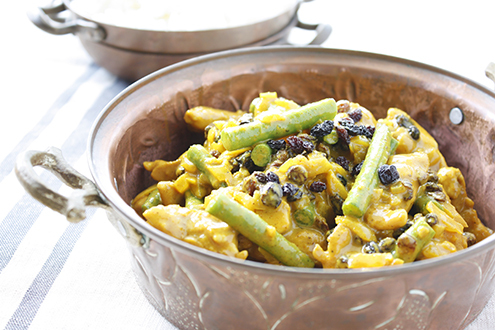 I sometimes think of curry only for cooler weather but the freshness of the green beans and cucumber on the side made this dish fine for a hot day like today. Thanks again for your beautiful blog, I love it! This is such a great recipe! My husband loved it. I actually simmered the chicken and some pork also and with the curry powder and water let is simmer for 30min before adding the rest of the ingredients. It was delicious. Teamed it with 35g of carb of low carb rice. My levels came in at 6.7, so perfect but will try with a little less rice next time. Keep them coming, love it!